I write you on the eve of Game 7 against the Boston Bruins, I write you on the verge of greatness, and on the verge of becoming instant heroes in the city of Vancouver, and in the hearts of Canucks fans everywhere. 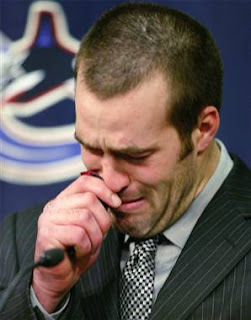 Before we get to the task at hand, let's take a trip down memory lane from a die-hard Canucks fan for 20 years. When I first started following this franchise, the likes of Gerald Diduck, Doug Lidster, and Robert Dirk manned our blue line. My friends and classmates coveted a hockey stick from Cliff Ronning because his was *almost* short enough for us to play with. I was 10 years old and watched us beat the Winnipeg Jets, but lose to the Los Angeles Kings and the Edmonton Oilers in years before the 1994 run. I remember Petr Nedved's point streak, our home unbeaten streak that saw us win a division. I remember Robert Dirk wanting to play in the USA, and Petr Nedved wanting out of Vancouver. 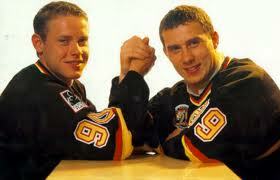 I remember searching for that beloved Pavel Bure rookie card, no, not the rollerblading one, but the other one! When our 1994 run came, I remember listening to the radio in bed late at night when Linden forced a seventh game against Calgary. Then I remember Pavel Bure scoring 'the goal'. 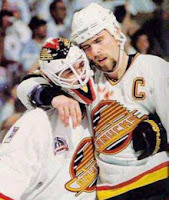 Bure's elbow on Churla, Greg Adams beating a slumped Felix Potvin, Greg Adams silencing Madison Square Garden, the BS game misconduct to Pavel Bure, the penalty shot against Richter, Messier trying to cripple Linden, Trev almost single-handedly willing the Canucks to the Cup in Game 7, and of course, Nathan Lafayette's goal post and the inevitable heartbreak. In the years that followed I watched Pat Quinn gamble that the NHL was moving small and fast. He loaded up with Alexander Mogilny and Russ Courtnall, but the league got bigger and slower. Quinn was gone, our team was slowly falling apart. Bure's best days in Vancouver were behind him, so were Kirk McLean's, and our defense was led by Jyrkki Lumme and Dana Murzyn (those last two items may be linked). More lean years began. Pat Quinn, Tom Renney, Pat Quinn, Rick Ley, Pat Quinn, it seemed like a revolving door. 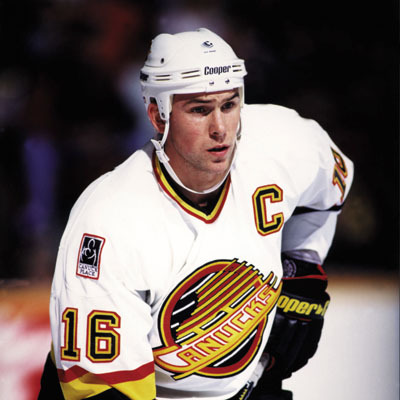 The Canucks lost to the Blackhawks in a bunch of overtime games while I cursed Chris Chelios, and I remember Gino Odjick scoring a couple of goals against the Colorado Avalanche in the year they won the cup. Pavel Bure got hurt, Alexander Mogilny wanted a Center to play with, and then Mike Keenan arrived. The Rule of Iron Mike saw more players come and go then I can ever recall. I remember one game where Esa Tikkanen, Roman Oksuita and Alex Mogilny lit up the St. Louis Blues and thought 'maybe this is the team we're supposed to have.... they've finally arrived!' Nope, I was wrong. Martin Gelinas led our team in goals, surprising almost everyone, and the bottom was starting to fall out. 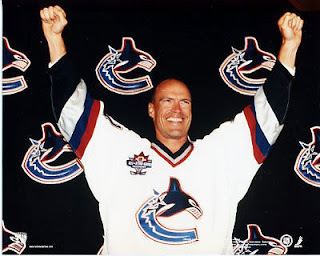 Eventually, the hated (from 1994) Mark Messier was signed. A return to the playoffs seemed imminent. Suddenly though, Trevor Linden was gone, Kirk McLean was gone, Pavel Bure was gone and we were left with Mark Messier and a bunch of young players left in the wake of Iron Mike Keenan. Despite the lack of success and the veteran signings that failed, Mattias Ohlund, Markus Naslund and Todd Bertuzzi began to emerge. 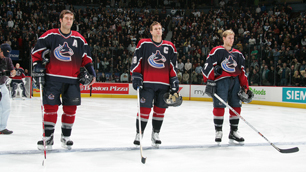 1999 saw Markus Naslund lead the team in scoring for the first time, and the playoffs once again appeared to be a possibility. Brian Burke and Marc Crawford arrived and began to make some moves that planted seeds for the future. Alexander Mogilny was traded for Brendan Morrison, Bryan McCabe was traded to draft the Sedin twins, and the signs of a solid hockey team were beginning to emerge. 2002 saw the emergence of the most dominant line in the NHL for a brief period, and an emerging Western Conference power. Markus Naslund and Todd Bertuzzi led a dynamic squad that almost upset the all-star Red Wings, but a Nicklas Lidstrom slap shot from center quashed all hopes of an upset that year. "Next Year" was the mantra. The Canucks were the best team in the second half of the year, and served notice to the rest of the league. 2003 saw the Canucks forfeit the Division, Art Ross and Rocket Richard Trophies on the last game of the season, prompting Naslund's infamous 'we choked' speech. A rebound against St. Louis provided a date with the Minnesota Wild. Once again though, a heartbreaking collapse saw the team blow a 3-1 series lead, and the 2-0 lead late in the second period on home ice. Undone by some bad luck and poor goaltending at times, the Canucks seemed to be a piece short of the Stanley Cup puzzle. "Next Year"
2004 saw the infamous Todd Bertuzzi incident with Steve Moore, crippling and distracting the squad down the stretch. Dan Cloutier was hurt, Martin Rucinsky wasn't exactly an effective replacement for Bertuzzi, and a promising year was lost in overtime of Game 7 against the rival Calgary Flames. An NHL Lockout and Bertuzzi fallout began to strip this team apart once again. The Sedin twins were taking over as the top line, and a disastrous set of games culminating in a bad loss in San Jose sealed the Canucks fate in 2006. 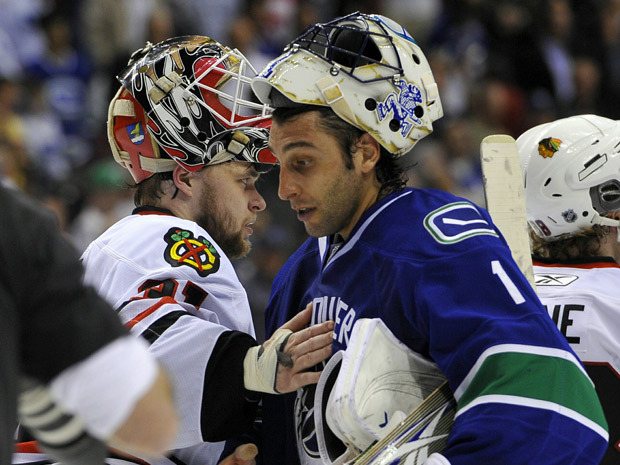 Bertuzzi and Crawford were out, Roberto Luongo was in. Brian Burke was also out and Dave Nonis was in. New management and a new franchise goaltender was supposed to bring stability to the team and hope to it's fan base. Roberto Luongo's first year showed Canucks fans what Vancouver was lacking since 1994 - quality goaltending. A seven game victory over Dallas proved what a hot goaltender can do in the playoffs, but the Canucks' lack of depth up front was evident against a talented Anaheim squad. Who could forget Roberto Luongo's incredible Game 5 performance, and subsequent panic attack for Canuck Nation when he was nowhere to be found after regulation, prompting a heroic effort by Dany Sabourin to hold the fort until Luongo returned. 2008 saw the Canucks miss the playoffs due to a lack of offence, but 2009 looked like there would be brighter times ahead. Dave Nonis was out and Mike Gillis was in. Gillis' voice was refreshing. Rather than try to build slowly, Gillis preached a championship mentality, and a desire to get the Stanley Cup to Vancouver as soon as possible. Preached to about patience for years, this sounded like music to the ears of Vancouver fans. Signings of Pavol Demitra and Mats Sundin, and the emergence of Alex Burrows and Ryan Kesler suggested good times may be ahead. The Canucks swept the St Louis Blues, but met the upstart Chicago Blackhawks. Sure the Hawks hadn't won the Cup since the 60's, but it still seemed unfair. When is it our turn? Chicago is supposed to be too young, it wasn't their time yet. How did they learn so quickly? 2010 saw Henrik Sedin lead the league in scoring, and the Canucks were supposed to have learned their lesson against the Blackhawks. Unfortunately, the same story unfolded yet again, as the Blackhawks went all the way to the Stanley Cup, out-skating and out-muscling the Canucks. Vowing for a different outcome, GM Mike Gillis traded for Keith Ballard and Dan Hamhuis to get a faster and more reliable defense, and signed Manny Malhotra and Raffi Torres to get some sandpaper on the bottom two lines. 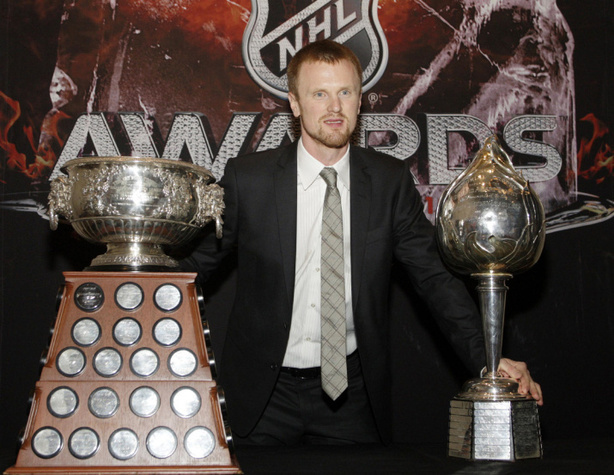 This time around, Daniel Sedin led the league in scoring. The Canucks were the best team in the regular season, leading nearly every statistical category worth following. Goals for, Goals against, Special teams, etc. Not since the 1978 Montreal Canadiens has a team lead in those categories. That brings us to the playoffs. A third shot at the Chicago Blackhawks finally went right, despite giving Vancouver a heart attack by almost squandering an 'insurmountable' three games to none series lead. Nashville was pesky, but no one other than ESPN's Scott Burnside thought the Predators would beat Vancouver. The Sharks posed a strong challenge but the Canucks got some timely goals to make quick work of San Jose. With all that behind us, the Stanley Cup Final appeared there for the taking. The Boston Bruins boast a great goaltender and defenceman, but lack the star power, depth and special teams prowess that the Canucks have possessed all year. And yet, here we sit on the verge of Game 7, with the Canucks having squandered a glorious chance to win at least one game in Boston and bring the Cup to Vancouver. If it's motivation or purpose you seek, take your pick. If you need intensity and anger, consider the horrible officiating you've endured all post-season, the incompetent writers like Bruce Arthur, Damien Cox, and pretty much anyone from Chicago and Boston who call you soft, gutless, heartless, or otherwise unworthy, your former teammates Shane O'Brien, Kyle Wellwood and Ryan Johnson who suggested you couldn't win, or anyone else who has ever doubted you. If it's animosity towards the opposition, think of the antics of Mark Recchi, Milan Lucic and Tim Thomas. Think of Johnny Boychuk's hit on Raymond, Rich Peverley's slash on Bieksa, lumberjacks Seidenberg and Chara, and of course the little twerp Brad Marchand. If it's camaraderie and inspiration from teammates you seek, look no further than the perseverence and determination of Sami Salo and Manny Malhotra. The sheer will of Ryan Kesler and Kevin Bieksa, the professionalism of Keith Ballard, the Sedin twins, Alex Burrows, Raffi Torres, and Roberto Luongo despite a media onslaught vilifying them. If it's an "us vs. the world" mentality you need - do it. Think of Dan Hamhuis, Mikael Samuelsson and of course Mason Raymond. Lastly, look up in the rafters. 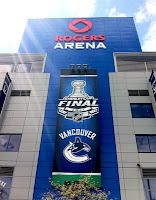 Stan Smyl, Trevor Linden, Kirk McLean, Greg Adams, Markus Naslund and various other Canucks greats were unable to bring the Stanley Cup to Vancouver, but Wednesday night you have that chance. 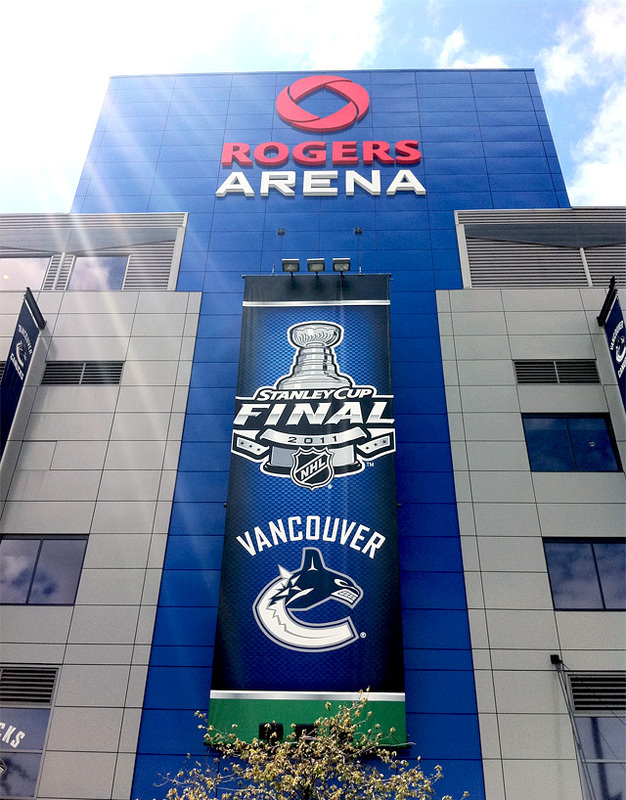 You may not be Canada's team, but you are Vancouver's team. From a long suffering Canucks hockey fan of 20 years, take your pick of motivators, there are plenty. Whether you think of Mason Raymond, think of your families, your critics, or your long time fans who would love for you to prove all your critics wrong...on Wednesday night, Just Win. is there a post-game 7 letter?